Today Disneyland Paris sent out a press release announcing that Moana - or Vaiana as she will be known in France - will feature at the resort during their Enchanted Christmas season, which begins on the 11th November. The press release was actually a little vague, giving no more details other than she will be at the resort during the season, so whether that means she will be greeting, feature in a new Christmas show, or in the parade, is yet to be seen. Disneyland Paris are notoriously bad at providing clear information, and are even worse at holding fast to what they have said - so we shall see what happens. At least, for now, we can say that Moana will feature this Christmas in some capacity at the French resort! The movie is released on 30th November in many places in Europe, including France, and the week before in the US, so it will also be interesting to see whether she debuts at the start of the season (starting 11th November), or if she will only appear once her movie premiers at the end of the month. Disney On Ice this week announced another brand new show, "Follow Your Heart", and while much of it is once again a rehash of previous shows, there are two really cool new scenes of note. A Finding Dory scene will be added, which, if the image and text on their main website is to be believed, should feature Dory, Hank and Nemo. Of course Dory and Nemo have featured before, but the Finding Dory characters, such as Hank, and story will be new to Disney On Ice. 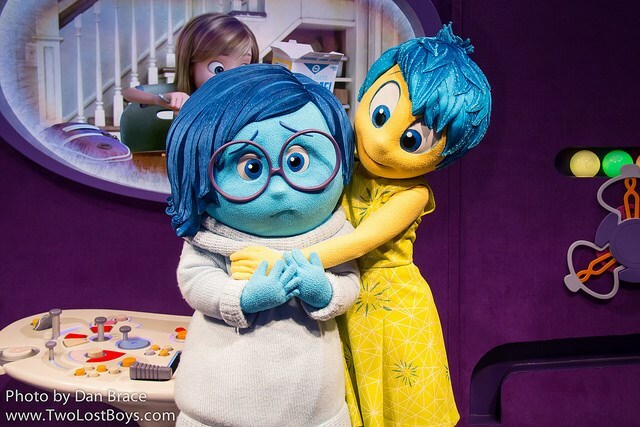 Additionally - and the most exciting part of all - characters from the blockbuster PIXAR movie Inside Out will be added! After waiting for an eternity for them to come to the US parks, we are now also going to see them in this new show. Again, things are a little vague, but from what the images depict, and what the text on the website says, at very least we should expect Joy, Sadness and Anger, and most likely Fear and Disgust, too! The new show starts in the Washington DC/Baltimore region at the end of October. You can buy pre-sale tickets on Ticketmaster now, using the code "BUBBLES". As always, Character Central has been receiving continual updates. This week I added Constance Purchase (Main Street Citizen), Captain Phasma, the March of the First Order, The Jungle Book: Alive with Magic, and Star Wars: A Galaxy Far, Far Away. Also, you can find out about our latest trip to Walt Disney World in part one of my most recent trip report, here on the blog. In this part I share with you our adventures at the Magic Kingdom, Animal Kingdom, Disney Springs, the Boardwalk and the three separate Disney resort hotels that we stayed in during our trip. This weekend we will be in Disneyland Paris, so be sure to follow us on Instagram and Facebook to see our live updates from the resort.